Product #21261 | SKU 202962 | 0.0 (no ratings yet) Thanks for your rating! 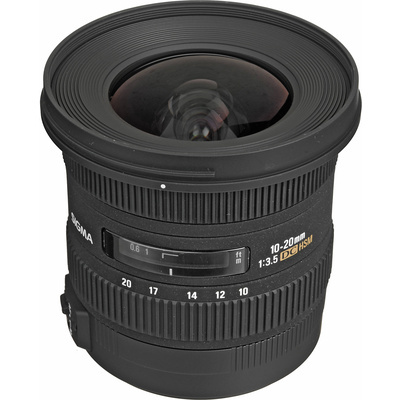 The Sigma 10-20mm f/3.5 EX DC HSM Autofocus Zoom is a super-wide angle lens with a relatively bright f/3.5 maximum aperture throughout its zoom range, helping to ensure high image quality. The lens gathers enough light to make it a great choice for indoor shooting as well as landscapes and creative portraiture. This version of the lens is exclusively made to fit Sony's Alpha lens mount, which is also shared by the discontinued Minolta Maxxum cameras. It is not intended for use with Sony's "full frame" digital SLR cameras, or for any film-based Minolta Maxxum cameras. With a wide-angle viewing range of 102.4-63.8°, this lens can empower a photographer to produce creative images with exaggerated perspective. Its Super Multi-Layer coating reduces flare and ghosting, and a HSM autofocus motor provides quiet operation, high speed, and perhaps most important the ability to manually override focus position at any time. The 10-20 f/3.5 EX DC HSM incorporates an inner focusing system to eliminate front lens rotation, which also makes the lens able to use an included petal-type bayonet hood to eliminate extraneous light from striking the front of the optic. Two ELD (Extraordinary Low Dispersion) glass elements and a SLD (Special Low Dispersion) glass element provide excellent colour fidelity, and 4 aspherical lens elements provide correction for common distortions.